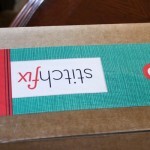 When Jenna first blogged about StitchFix about a month ago, I knew it was something I would love. It’s kind of funny because I used to spend a lot more time in workout clothes and pajamas, but now when I leave the house with Liv, it’s kind of fun to wear “real” clothes since she’s not wearing her jammies. After Liv was born, I was pretty shocked by the lack of real clothes in my closet. I always wear workout outfits, had been living in the few maternity clothes I owned, along with lots of the Pilot’s T-shirts. Things fit me differently than they used to and I donated a lot of clothes when I first got pregnant. When Liv and I are out and about, she’s pretty easygoing and fun to take anywhere, but clothes shopping is a nightmare. I can grab things and buy them, but when it comes to trying on, she’s not down with waiting for me. Last time we went to the mall with a mission to get a cute casual outfit, I ended up singing “Itsy Bitsy Spider” probably 4 times while quickly trying on the top and pants, waiting for the time bomb in the stroller to sound the alarm that she was ready to keep moving. Also, since my brain has officially turned to mush, I can’t for the life of me remember what I still own, that actually fits, that might match things I see on the random shopping occasion. 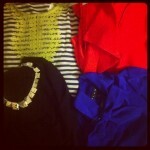 StitchFIx to the rescue for all of the above. Before I get into the review, I just wanted to let you guys know that this post wasn’t sponsored in any way. 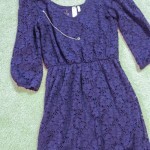 I’m pretty such the StitchFix peeps don’t even know I have a blog, haha. I paid for everything with my own money, loved it, and wanted to help spread the word. -You fill out an extensive style questionnaire with your height, weight, style preferences, the types of clothes you’re looking for, colors and patterns you love/hate and rate certain outfits. It’s very thorough and fun to fill out. -You schedule your “fix” for the week you’d like it to arrive. -The fix is delivered (there is a $20 styling fee which is used as a credit to any pieces you’d like to purchase) and contains a mix of different tops, dresses, pants, accessories, anything you requested, hand-picked by a stylist just for you. 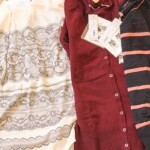 -You try on the pieces with things you already own at home, keep and pay for whatever you love and send back the rest. The shipping bag that’s included is extremely easy to use. It’s pre-labeled and accepted by USPS, so mine just went out in the regular ol’ mailbox. Pretty brilliant. It was like Christmas when the first one arrived! I didn’t have to drive anywhere (or entertain a little one in a stroller) and could actually take the time to try on everything. 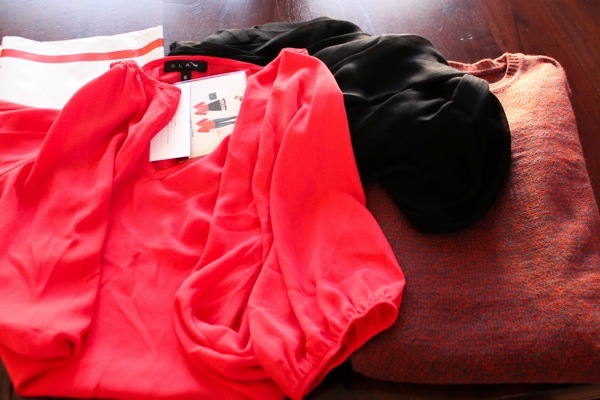 In my package was a gorgeous red blouse, black jegging-type pants (super soft), a sweater dress, sweater and black scarf. 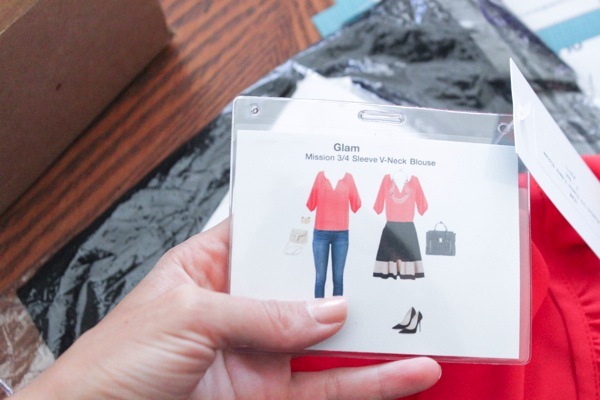 One of my favorite little touches: the tags offer mix-and-match strategies for outfits. EVERYTHING fit. 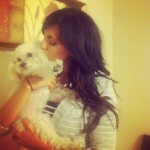 Let the angels sing. So there ya go! If you’ve been wanting to sign up, here’s the link with an invitation! What a great idea! I have to check this out! Can you give a range of how much the items in the package cost? This is so cool, Gina! I will definitely check it out. 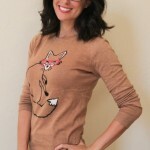 ooh, I love that sweater! Wow, this is great! I loveeee that sweater, definitely unique! How fun is that! I’m not a huge fan of shopping and can usually never find something I like so this would be perfect for me! I absolutely love that sweater. Love that sweater on you! What brand is that sweater?! I can’t wait to try this! How long did it take for your invitation/first order? Whoever came up with this is a genius!! This would be perfect for me because I’m terrible at picking clothes out. How long did it take you to until you got to join? Gina I love this. I’m going to sign up for it. By ay chance, did that sweater have a brand name or do you happen to know if I can find it anywhere else? the brand is mystree. when i tried it on and loved it, i googled around trying to see if i could find it online to check reviews and compare prices. i couldn’t find it- hopefully you can! 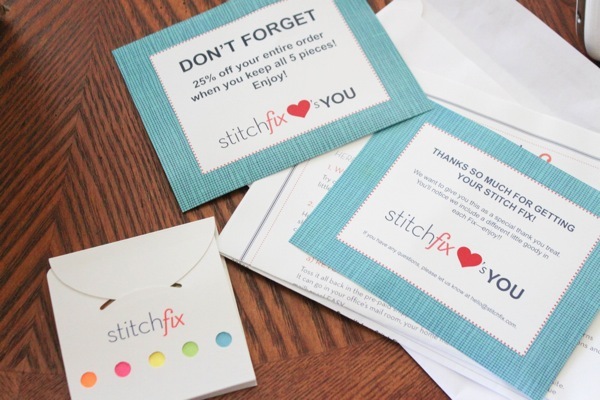 I signed up for stitchfix when I saw it on Jenna’s site, too! I really enjoyed the outfits/accessories they sent. I think my only complaint is that some of the clothing was super expensive (for me), eg $65 for a shirt. This is amazing. I love that sweater! This is a great idea! I’m definitely going to check it out! i have been wanting to do this but i’m worried about the pieces being super expensive. was everything in a price range you were comfortable with? Hey Gina! Where is your watch from? (The one you’re wearing in the last picture.) I love the colors! I read about this on Jenna’s blog and I LOVE the idea. With a 14 month old, I agree shopping just doesn’t go as easy as it used to, so I love that the shopping part is done for you and all I have to do is try it on. Your shopping trips sound about like ours, last time we went I thought I could get away with trying a couple of things on and while she played in the dressing room…haha, she kept crawling out the bottom and I’m pretty sure the whole store thought I was nuts when this little girl kept getting dragged back in by her heels. Seeing your post and Jenna’s makes me really consider this especially since you can specify the prices. I don’t want to order it and then end up spending an arm and a leg! But this seems very doable and fun. Thanks for posting about it! I signed up for the ‘as cheap as possible’ option, which looks like it’s under $50 based on the next option being $50-$100. I’ll comment back on how I like it in a couple weeks (week of 12/15). I hope you got a $25 credit for it! Gina – thanks for the review! I love this idea. I used to use department store personal shopping services , but now with a baby (1 mo older than Liv) I can barely get to a store. Thank you so much! this sounds AMAZING! 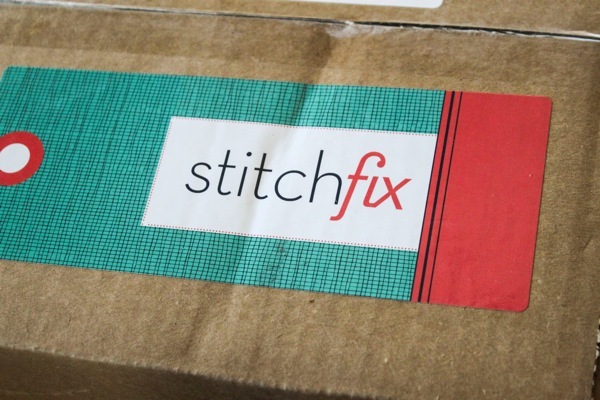 i’m a little confused by one thing, though: can you do a one-time stitchfix, or is it a montly membership fee type thing that you have to join, and pay every month?